La Jolla, San Diego, California, U.S.
Francis Harry Compton Crick OM FRS (8 June 1916 – 28 July 2004) was a British physicist, biologist and humanist. He is one of those who worked out the structure of DNA. Using X-ray crystallography results from Maurice Wilkins' biophysics team at King's College London, Crick and James Watson discovered that DNA has what is called a "double helix structure". This means that DNA is made of two chains wound round each other to make a spiral. Only one of the chains carries information, but the two chains together makes the molecule more stable. DNA is the basis of heredity for almost all forms of life today. Crick, Watson and Wilkins won the Nobel Prize in Physiology or Medicine for 1962. Their work sparked a huge amount of research in molecular and cell biology and, as a result, many subsequent Nobel awards have been made. 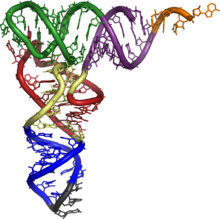 Molecular model of a tRNA molecule. Crick predicted that such adaptor molecules might be links between codons and amino acids. The adaptor molecules were eventually shown to be tRNAs and the catalytic "ribonucleic-protein complexes" became known as ribosomes. An important step was later realization (in 1960) that the messenger RNA was not the same as the ribosomal RNA. In his thinking about the processes linking DNA genes to proteins, Crick made clear the distinction between the materials involved, the energy required, and the information flow. Crick was focused on this third component (information) and it became the organizing principle of what became known as molecular biology. In the final phase of his career, Crick and Christof Koch published a series of articles on consciousness (1990–2005). Crick decided to focus his work on how the brain generates visual awareness within a few hundred milliseconds of viewing a scene. Crick's book The Astonishing Hypothesis made the argument that neuroscience now had the tools required to begin a scientific study of how brains produce conscious experiences. The Francis Crick Institute is a £660,000,000 biomedical research centre in London. The Francis Crick Institute is a partnership between Cancer Research UK, Imperial College London, King's College London, the Medical Research Council, University College London (UCL) and the Wellcome Trust. It is the largest centre for biomedical research and innovation in Europe. The Institute is next to St Pancras station on the Euston Road. It has an annual budget of over £100 million. The building’s vaulted roof is arranged into two shells and is fitted with solar panels. A third of the building is below ground to reduce its visible mass. ↑ "Francis Crick - Biography". nobelprize.org. Retrieved April 11, 2010. ↑ Crick FH (1958). "On protein synthesis" (PDF reprint). Symp. Soc. Exp. Biol. 12: 138–63. PMID 13580867. http://profiles.nlm.nih.gov/SC/B/B/Z/Y/_/scbbzy.pdf. ↑ 5.0 5.1 Jha, Alok (19 June 2010). "Plans for largest biomedical research facility in Europe unveiled". London: The Guardian. Retrieved 11 August 2010. ↑ "Three's company: Imperial, King's join UCL in £700m medical project". Times Higher Education. 15 April 2011. Retrieved 16 April 2011. ↑ "Project Press Release". UK Centre for Medical Research and Innovation web site. 21 June 2010. Retrieved 11 August 2010. This page was last changed on 11 January 2019, at 05:19.